Deciding the “top” things to do in Rome is no easy feat. Rome is such a wondrous, historical and cultural city. Below, you’ll find a mixture of can’t-miss tourist attractions, along with a few off the beaten path spots. 1. Colosseum and Roman Forum: Building began in 70 AD and was officially opened in 80 AD. To this day, it is considered one of the most beautiful sights in the world. Depending on the time of year, the queue can be quite long, but the hour or so wait is well worth it! For a mere eight euros, you get to see the Colosseum, the Roman Forum and Palatine Hill—all filled with so much history and ruinous beauty. 2. Trevi Fountain: Another Roman staple is the Trevi Fountain. Some feel it is a more romantic spot than the Colosseum, but both have their romantic features. Beauty is in the eye of the beholder, after all. 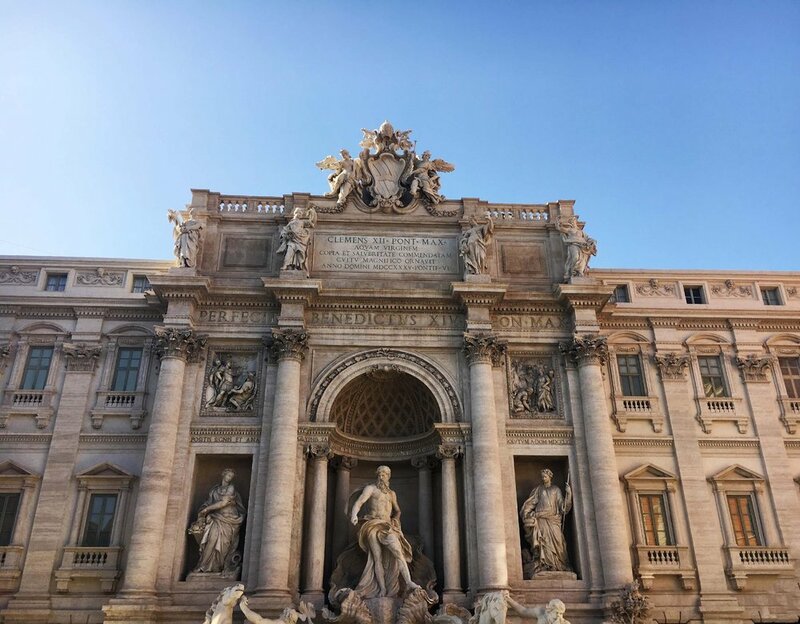 In the two weeks I was in Rome, I witnessed three ing fountain side proposals.The Trevi had four architects and took 30 years to build (1732-62). To this day, no one knows what is actually inside the building. If you visit the fountain, grab a gelato at any of the nearby Gelaterias. If you can find a seat, take it and enjoy the sounds, sights and sweets. Legend has it, if you throw a coin in backwards before you leave, you’ll return to Rome one day. 3. Spanish Steps: If you go during the summer months, you’ll often find them covered with tourists taking a break from roaming the streets to enjoy a seat and a cold gelato. If you walk to the very top, you’ll see a beautiful church called Trinita dei Monti. The Spanish Steps are actually the division between the Piazza di Spanga and the Piazza Trinita dei Monti. 4. Pantheon: The Roman Pantheon is one of the most well preserved buildings from Ancient Rome. What was once used as a Roman temple is now a church to commemorate St. Mary and the Martyrs. Entry is free, but the queue can be long. If you are ever strolling around and notice a shorter line, take advantage and enter this unique and beautiful ruin. Even today, people still marvel at how the Ancient Romans were able to make the building a perfect sphere. 5. Vatican City and the Sistine Chapel: Vatican City is nothing short of magnificent. It is the embodiment of culture, art, beauty, royalty and history. The architecture itself is worth seeing, but as an artist, there was nothing more beautiful to me than the Sistine Chapel. If you are coming to Rome, this 10 minute metro ride is definitely worth a day. Order your tickets before hand to skip the queue and marvel at this beautiful church and every bit of artwork within it. If you want to see the Pope, be sure to come on a Wednesday. 6. Galleria Borghese and the Gardens: Take a day to admire the beauty of both. The Galleria Borghese houses a substantial part of the Borghese collection paintings, sculptures, and antiques began by Cardinal Scipione Borghese, the nephew of Pope Paul V. The gallery consists of 20 rooms and two floors. The gardens are just as beautiful and well kept; if you continue to walk along the park you will see two more museums (Galleria Nazionale d’Arte Moderna and Museo Nazionale Etrusco), a zoo and a horse arena. 7. A walk up to Pincio: Piazza del Popolo is a very happening square here in Rome. Filled with restaurants and cafes, it is the start to one of the most popular streets in Italy, Via del Corso. Oftentimes in this Piazza, you’ll see people setting up for tennis, concerts, and markets. A very unique feature of this Piazza is Pincio, a hill where you can witness a panoramic view of Rome. Trust me, the view is definitely worth the trek. 8. Circo Massimo and the Rose and Orange Gardens: Maybe one of Rome’s best kept secret, these gardens are absolutely stunning. Take a romantic stroll past the Colosseum and all the ancient Roman ruins, and once you see the sign ‘Circo Massiom,’ you’re here. Walk through an ornate gate and you’ll see rose gardens on either side of you. Both gardens consist of cobblestone walkways, rose covered gazebos, and fountains, each different than the next. Keep on this cobblestone path up the hill and you’ll reach a garden full of orange trees. Don’t eat the oranges—they’re sour and used solely for aesthetics. At the end of the garden, you’ll reach a viewpoint that allows you to see all of Rome. If the weather is right, nothing can ruin a day in these gardens. 9. The market at Campo d’ Fiori: This is by far one of the best markets in Rome. The market operates daily, making it one of the few dependable markets in the area, but it is also fresh and exciting every day. The fruits, breads, pastries and foods are delectable. Located right in the center of a great shopping area next to the wonderful Piazza Navona, this is a great place to come and get a snack or light lunch while shopping around the market and side streets. 10. Piazza Navona: A popular, central Piazza in Rome, Navona is filled with restaurants, gelato shops, three fountains, a large church and ample shopping. The market at Campo dei Fiori actually used to be held in the Piazza Navona, but over time was moved. The main fountain is Fontana de I Quattro Fiumi. Legend has it that Bernini positioned the sculptures as if they feared the facade of the church, Sant’Agnese, which was constructed by his enemy. 11. A night in Monti: Monti is the perfect place to have a fun and romantic night out. It is right by the Colosseum, which is beautifully illuminated at night. Monti attracts a younger crowd, with great bars and unique restaurants. It is a perfect blend of traditional and contemporary Rome. Monti is one of the best places to come grab a drink and some tapas, admire the fountain and the beautiful night sky. Comment below your favorite things to do in Rome! Never traveled abroad, so we feel fortunate to know folks who have, sharing pics and insights. Great article. (Almost) Like we were there! I love this post! I am going to Rome later in the Fall and looking for suggestions of things to do pass the typical monuments (which I know are incredible)! Thank you!